"ReConnect Week - Spring 2019"
GIFT OF TIME. RIGHT HERE IN COASTAL ALABAMA. Operation ReConnect will be hosting military service members and their families for a full week to reconnect after returning from an overseas Combat Deployment. With the continuous support we receive from the City of Orange Beach along with many local businesses, together we can show our pride and support for the families who sacrifice so much to keep the United States of America safe. 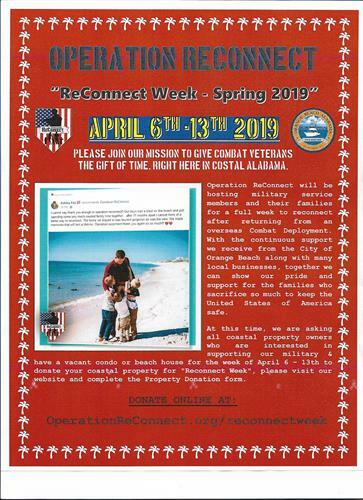 At this time, we are asking all coastal property owners who are interested in supporting our military & have a vacant condo or beach house for the week of April 6-13th to donate your coastal property for "Reconnect Week", please visit our website and complete the Property Donation form.